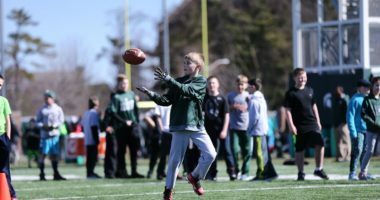 EAST LANSING, Mich. – The Michigan State football program hosted its annual Pro Day at the Duffy Daugherty Building on Monday. Eight players from the 2018 team – offensive guard David Beedle, linebacker Andrew Dowell, cornerback Justin Layne, defensive tackle Gerald Owens, linebacker Jon Reschke, running back LJ Scott, tight end Matt Sokol and safety Khari Willis – auditioned in front of National Football League scouts and personnel in preparation for the upcoming NFL Draft. In addition, wide receiver Felton Davis III was also in attendance for meetings but didn’t participate in drills as he continues to rehab from an Achilles injury he suffered on Oct. 20. Fifty-two personnel representing all 32 NFL teams and three CFL teams attended the event. In addition, credentials were issued to more than 30 media members. Michigan State has had seven defensive backs selected in the NFL Draft since Dantonio took over as head coach in 2007, the most of any position at MSU during that time period, including first-round cornerbacks Darqueze Dennard (Bengals, 2014) and Trae Waynes (Vikings, 2015). Several coaches and scouts watched the defensive backs drills with keen interest as Layne and Willis continued to showcase their skills they already put on display at the NFL Combine. Layne kept his test numbers from the NFL Combine (4.50 seconds in 40-yard dash; 37.5-inch vertical; 11’2″ broad jump; 6.9 seconds in 3-cone drill; 4.09 in 20-yard shuttle) and elected only to participate in position drills. Willis ran the 20-yard shuttle and 3-cone drills, events he did not run in at the combine. In Indianapolis, Willis posted a 40-yard dash of 4.52 seconds, a vertical jump of 34.5 inches, a broad jump of 9’10” and 22 reps on the bench press. Scott went through position drills at running back and ran the 40-yard dash, an event he did not participate in at the NFL Combine. He kept his other test numbers from Indianapolis (33-inch vertical; 10’0″ broad jump; 7.27 seconds in 3-cone drill; 4.34 in 20-yard shuttle). 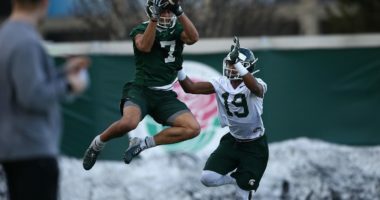 The Spartans had four players attend the NFL Combine – Davis, Layne, Scott and Willis – but for the other five seniors, it was their chance to show their potential at the next level. Sokol, who played in the East-West Shrine Game, put up 23 reps on the bench press, which would have ranked second among tight ends at the NFL Combine. He also displayed his athleticism with a 30.5-inch vertical jump and a broad jump of 9’4″. Dowell, a durable outside linebacker who had 260 tackles in 51 career games, had the longest broad jump of the day at 9’10” and also posted the second-highest vertical at 31 inches. He put up 20 reps on the bench press. Beedle led the way on the bench press with 26 reps of 225 pounds, while Reschke ranked second with 24 reps, which would have tied for sixth among linebackers at the NFL Combine. Reschke also had the highest vertical leap at 31.5 inches and the second-longest broad jump at 9’8″. The 2019 NFL Draft is set for April 25-27 in Nashville, Tennessee. Michigan State is one of just five schools to have had at least one player chosen every year since the inception of the common NFL Draft in 1967. In addition, at least one Spartan has been selected in the NFL Draft since 1941, the third-longest streak in the FBS (78 straight). 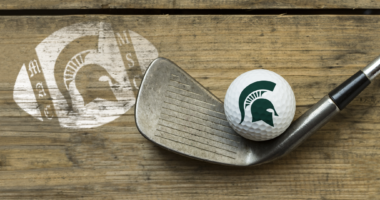 Twenty-nine Spartans have been chosen in the NFL Draft under Dantonio’s watch, including three consecutive first-round selections from 2014-16. Everything has been going smooth. The healing process has been going pretty smooth and pretty fast. That is what I’m working towards… yes. I’m not sure exactly a timeline. I’ve just been talking to the doctors and trainers and we’re going to figure all that out, my prognosis and timeline throughout this whole last few weeks leading up to the draft. Right now it has been a lot of strength training, running and stuff. I’ve finally been running on treadmills and running out on the field. When you tear your Achilles, you have to get strength back in your calf. That’s the biggest thing that I’ve been working on. When I get 100 percent strength back in my calf, it’s fair game. It makes you hungry. It’s hard, especially being a competitor, when you have to sit out and watch. It’s hard because you know you can do everything everyone else is doing, and maybe just a little better. The whole process just touches you and you know how to be patient. Things come to those who wait. You can’t plant a seed and think the flower is going to grow in a day. You just have to be patient with it. Things have been good. I’ve been training for this day for a while, so it was good to get out here, perform with my guys and get reacquainted with everything. It’s definitely a full time job. I was talking to some of the guys and comparing it to a winter conditioning test or a gasser test. You can get fatigued throughout the workout. You have to keep your mental sharp as you’re going. It was a good day overall. Yes, the coaches test you. There’s a running clock for everything. You have a certain amount of time to warm up. You have to be ready to go between each event and make the most of it. I wanted to have a good 40. That was my biggest thing. Show them that I have speed and that I can run. I can be a sideline-to-sideline type of guy. I also wanted to look good as far as my footwork and my drills. I’ve talked to a few teams and they’ve mentioned a few things as far as a deep-half type guy as far as in their defense. It all depends on the specific schemes and specific defense for that team. It’s crazy, especially knowing that these are NFL team coaches right here telling us things with Khari (Willis) and I; he’s a safety and I’m a corner, so we do some of the same things, but some stuff a little differently. They wanted to see how I changed direction, since I’m a little longer, so some of the drills were a little different for me than for him. I don’t really get so much into that. I feel like at this point of the process it’s kind of good to not think about it and just control what you can and don’t worry about what you can’t. I just hope I get drafted as high as possible, that’s the goal. Yes, I feel people talking and I hear some of it, but at the same time, I’m just trying to handle one thing at a time, especially Pro Day. I’m not trying to get too much into all that stuff until Pro Day was over. I’m just trying to enjoy the whole process. You only get to do it one time, so I’m trying to enjoy that. Oh it’s a lot different, it’s just being back with my family, my brothers, being with all the coaches and Coach Dantonio again. It’s kind of weird, but there’s not much worse feeling than being at the Combine, when it’s only you and all the top players in the country, and all the NFL coaches, but right here today I got to be in front of my friends and all my teammates that I went to school with for years, so it’s pretty cool, I definitely felt more relaxed. That’s one thing that I feel that I’ve benefited the most from in interviews like that is on the field or watching film of me, I feel like I play differently than I am, they’re able to see me in person and I’m more of a laid back, even goofy type of guy. But most people won’t get that or see that on film, so I feel like the interview process definitely helped me. If they invite me, I’m definitely going to go there, but I think I’d rather be at home with family, be around the people that kind of made me the person I am, even if I get the choice, I think I’d still choose to be at home around family, that’s just the type of person I am. It just felt more comfortable doing it here. I was kind of late at getting the training in for it. I was more focused on getting my body right first and then letting everything else even out. I just feel like once I actually got my body right it was a little too close to the combine, so I decided not to run it. My agent and I talked about it as well. I decided not to run it and run it at Pro Day. I think I did decent. You can always get better in everything you do. I feel like my numbers were decent. I was definitely shooting for a little higher on some of those numbers that I hit. Overall, it was decent. It was a fun experience, great experience. I got the chance to talk to a lot of coaches. It was a great experience. One that I will always remember. Basically, just to look sharp and give it my all and show 100 percent effort, be very coachable, and just show them that I’m a player and this is what I do. I’ll be here in East Lansing, so I’ll be coming back to the facility here and working out here just in case any coaches want to work me out and everything in that matter. I’ll be here getting used to East Lansing again and keeping it cool. It’s a weird feeling. You’ve been thinking about this for a long time from January watching the combine knowing that today was your day to perform and have that experience. I guess there’s a little bit of a weight lifted off now that it’s over. I left it all out there, did the best that I could and I was happy with how I did. I think a lot of the guys around here feel that way as well. I think I surprised people with my routes. I felt fast, I felt fluid, I felt smooth. I caught the ball well and I think I showed my speed today for being the size that I am, which I’m really happy about. It’s been an unbelievable journey. I’ve grown so much as a player and a person since then. It has changed so much. It is pretty funny thinking that at one point I was back there throwing the ball at people. I haven’t done that in five years. I’m very thankful for this journey and everything I’ve gone through has made me a better person. Ultimately, it has made me a better football player from all the successes I’ve had and all the failures I’ve had. It’s an interesting process, you dream of going through the process and try not to get overwhelmed with everything, especially Combine, Senior Bowl, everything, but each step I feel has been a success for me, personally, and for my teammates out here. To be able to go through this with some of the closest guys to you has been exciting. I thought it was a great process, I thought I did really well and I feel like I accomplished everything that I wanted to accomplish there. I went in there with the mindset that I wanted to be strong, be fluid and have a good day on the field, and I feel like I did that. With the feedback that I’ve been getting, I feel like I did that. Yes, I feel more comfortable here, obviously you’ve got your former teammates, your brothers, watching and cheering you on, and your family is here, and your coaches are here, but once you get moving around it’s all the same to me. Just being able to go out and showcase yourself and hopefully be able to prove anything they want to see. Not really, they’ve talked to be about that other stuff a little bit, but it’s mostly all been football. They know football and they know who can play, and they’ve been telling me they feel like I can play. That’s been it more than anything, I feel like that’s the icing on the cake. All the leadership skills and being able to learn something and teach other people, I feel like that’s just going to help me. I’ll just continue to be myself on and off the field, and let God take care of the rest. Not really, because I’m done with school, and now that I’m done with school I can just focus in on one thing, and I feel like each step you’ve dreamed of it and know it’s going to come up, so you just prepare for each step. Now I’ll prepare for individual workouts and any visits. I count it all as a blessing, to be in this position and just try to make the most out of it. Yes, I got a lot of stuff out of the way at the Senior Bowl, I felt like I had a good showing there all week in practice and played solid in the game. I was able to work with some coaches in some individual NFL schemes and get an idea of what they like and what they’re looking for, and then go prepare for the Combine, and from the Combine, go down to Florida and train with Felton (Davis), and see him get better. That was one of the best things was seeing his process and see him back running and getting strength in his leg. Then for me to come here today and put up good numbers and just be fluid. It’s been funny but it’s been humbling. It’s been good to see a guy like Justin Layne come in and be able to put himself in a good position; see a guy like LJ (Scott) go down with injuries but be able to come back; see a guy like (Matt) Sokol still working hard behind the scenes; see (Jon) Reschke come back, see all the guys, it’s just been humbling. It’s been a tremendous experience and I wouldn’t want to go through it without any different group of guys. For sure, definitely, we talk almost every day. Justin (Layne) and I, we call each other almost every day or at least every day, just keep up with one another. We kept going through film, and we both sharpened each other on things, just trying to present ourselves to these teams the best we can. Yes, definitely, me and David Dowell stay in contact a lot, Joe Bachie, Kenny (Willekes), we all still stay in contact with one another when we can, they know I’ve been busy, but now that Pro Day is done, I’ll be here and we’ll connect even more. We’ll train together and be able to exchange a lot more. They’ve been asking and wondering how things have gone and given me support. It’s been great. I used to peek in here every year, but yeah my freshman year was Connor (Cook), Shilique (Calhoun), LT (Lawrence Thomas), Arjen Colquhoun, a lot of guys. I was thinking hopefully one day I could be here and I was kind of awe watching all those great players. They all had good careers here and some of them continue to have good careers at the next level. I’m just trying to make my own way, kind of like they did. I think they like my versatility; my tackling ability; my leadership in getting guys in the right position; they like the fact that I played in the slot this year, guarding a lot of the top slot receivers in our conference; I feel like they like that I can cover and I can tackle, and I think they like that I can play fast as well. Not at all, I didn’t play much defense, I’d blitz a little, but that’s it. I think the scouts and coaches like that I could learn something and adapt. 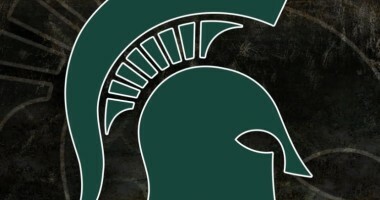 But I think more so, it speaks to Michigan State in how they can develop players here. I’d never played this position before coming here and now I have the opportunity to play it professionally. So that speaks volumes to this program, speaks to the two tremendous defensive back coaches I’ve had here, as well as to all the defensive coaches and Coach D. I feel that it tells people that if you’re willing to learn and work hard, you’ll be able to pick up on something. I’ll be around here training, here and back home in Jackson. I have no idea, I don’t know, but I don’t care if it’s the last one, I’ll take the opportunity and I’ll make the most out of it. I definitely still have room to grow. It’s about perfecting your craft. That’s what I’m learning now more than anything, I’ve got to continue to perfect my craft, I can’t take days off, I can’t slouch around. I feel like the biggest thing is nobody is getting you up to do it every day, you’ve got to get yourself up, and I like that because I’m self-driven, so I’ve got to continue just to perfect my craft. Justin and I are so close and we talk about everything, and everything I’m going through, he’s going through something similar, so we can relate, or at least advise one another. We talk about how we play different positions and we play together, but how we still have room to grow, we critique each other. Should be a great team, they’ve got great kids, great leaders, guys that have been on the leadership council two-three years coming back, having first-team All-Big Ten players coming back. On the offensive side of the ball, they’ve mixed it up a little bit with the coaches to try to get things going, but still have a lot of playmakers on that side of the ball. It’s going to be exciting, I’m going to be zoned in every Saturday. He’s a baller. Xavier’s a baller, obviously he tackles well, he covers well, he’ll be able to see things, it’s an opportunity for him to be able to step up. Him and all the other younger guys have the opportunity to step up and show what they can do. That’s what it’s been like since I’ve been here, so knowing those guys, they’re all going to step up and compete.